Yesterday was a big Social CRM release for HootSuite web, but we didn’t stop there and today have a treat for the mobile users. To go along with Apple’s release of the iPhone 4, we’ve updated an iOS4-ready version of HootSuite for iPhone with a number of new features to help you keep on top of the social media game. 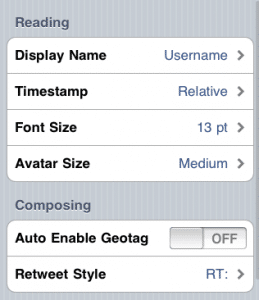 This round of treats includes addition of location-based social game “foursquare,” customizable re-sizing of fonts for easy reading, and updates to iPhone’s iOS4 to allow app switching and performance tweaks. Plus a basket full of preference goodies from RT-style choice to custom avatar sizes. Foursquare is a social game which uses location-based services to keep tabs on your friends, discover your city, and earn points. By being the most frequent visitor to your local coffee shop, pizza joint, you might be anointed “mayor” which can include all sorts of perks. Check-in and Shout out – Check-in then shout out your current location to your friends on Foursquare, Twitter, and Facebook. Check-ins streams – Find out where all of your foursquare friends have recently checked in so you’re never left out on the fun-times. Check-in history – Follow your own trail of check-ins and see where you’ve been — ideal for archiving activities for and memory recollections. Sign-up for a foursquare account to compete for badges and accolades with your friends or share your location on Twitter and Facebook. 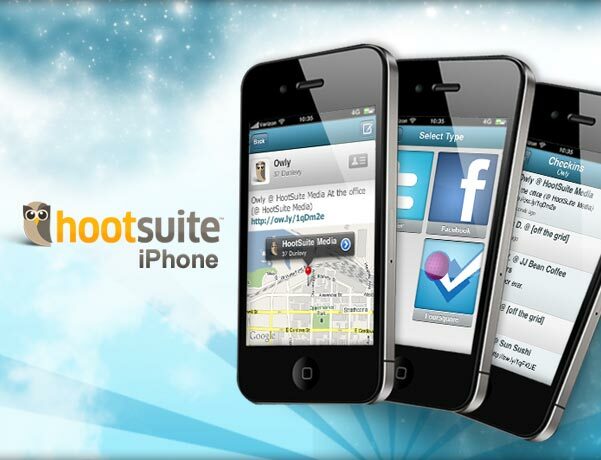 HootSuite is ready to go for iPhone 4 and iOS4. This results in performance improvements for iPhone 3G or iPhone 4, including ability to switch apps quickly — if you leave the app, you’ll return right where you left off with no waiting. Wanna change? Adjust preferences as desired starting under the Settings tab. 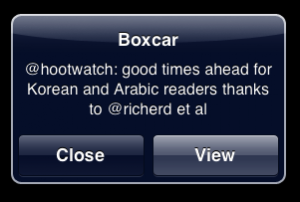 Push Notifications with Boxcar — This tool snuck in as part of the last release, but in case you missed it… Connect HootSuite with the Boxcar app (free) for instant push notifications whenever you receive a new @mention or DM. Instant Ow.ly links in Safari — While you are browsing with Safari and see a tweet-able page, just prepend the url with “owly://” (no quotes) and voila! you’ll pre-populate a HootSuite message with a short link ready send to your network. Suggestions for additional preferences that you’d like to see in a future update? Great! Don’t hesitate to add it to feedback.hootsuite.com. We are constantly looking for ways that we can improve how you compose and converse on-the-go. HootSuite for iPhone update is available at the iTunes App store in Lite (no-cost) and Full ($2.99 USD) versions. Follow @HootSuiteiPhone for updates. See hootsuite.com/iphone for more details. Finally, fans of RIM’s Blackberry phones can almost… finally begin Hoot-ing since HootBerry is just about ready for beta release. To get on-board for early access, simply sign up at: http://ow.ly/2aRUx and you’ll be among the first to try the new tool.